Signing the agreement between Sumitomo Electric and Sumitomo Electric Hardmetal. The demand for cutting tools is dramatically expanding today in China, India, Brazil, Russia and other emerging markets, say the companies. Rising demand for cutting tools is particularly noticeable in China in response to the rapidly growing automobile industry, and demand for these tools is also expanding dramatically in steel, railway, construction and other industrial sectors. In 2010, the Sumitomo Electric Group invested around 12 billion yen in new equipment and facilities to meet such rapidly expanding demand for cutting tools in the above emerging markets. The investment was used mainly: to improve the production of indexable inserts and cemented carbide drills in Japan; to increase the number of engineering centres in order to meet customer needs; and to scale up the production capacity for cemented carbide materials, sintered diamond products, and sintered cBN products. 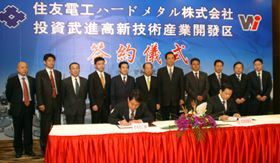 In 2011, the Group plans to spend about 18 billion yen, mainly to expand the global production scale and increase the tungsten recycling rate. In China, Sumitomo Electric Hardmetal Trading has opened sales branches in Beijing, Guangzhou, Dalian, Chongqing and other large cities to expand its sales network and meet rapidly increasing demand for cutting tools. In October 2011, SHMC will start producing cemented carbide drills used for drilling holes in steel members and castings as well as sintered diamond indexable inserts used for cutting aluminium parts that are used widely in automobiles today. SHMC says that it will make every effort to significantly reduce cemented carbide drill and sintered diamond tool production costs to supply these products to customers in China, Europe and other Asian countries.